As of press time on Tuesday, nine I.S. projects had been submitted. But with I.S. Monday less than a month away, more will be coming in. With Spring Break and I.S. Monday less than a month away, seniors are starting to feel the heat. Although the last I.S. doesn’t need to be submitted until March 28, seniors have already begun to trickle into the registrar’s office to submit bound copies of their theses. As of press time on Tuesday at 4 p.m., nine seniors had submitted their I.S. projects. Although the Registrar’s office would not release their names, Academic Records Assistant Jason Bowen was able to identify the seniors’ majors. The seniors interviewed below were identified by The Wooster Voice. The coveted first I.S. spot was nabbed by a Communications Sciences and Disorders major on Feb. 11. The second I.S. 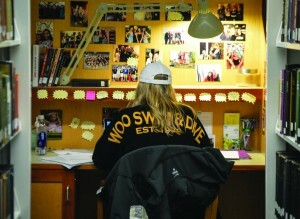 spot was claimed by English major Tori Horvath, whose thesis was submitted five days later on February 16. Horvath said in an interview with the Voice that turning in their senior thesis was an incomparable process. “Afterwards, it feels like, ‘What do I do now?’,” Horvath said. In addition to the first two I.S. projects submitted, the third project was turned in by a Geology major, the fourth was submitted for the completion of a self-designed major, and the fifth belonged to a Spanish major. The sixth I.S. was submitted by English major Michael Hatchett. “It’s more sad than I thought it would be,” Hatchett said of the experience. The seventh I.S. belonged to a Russian Studies major, the eighth to a Psychology major, and the ninth to a political science major. It is likely that more I.S.’s will have been submitted between press time on Tuesday and this paper’s publication on Friday, but Bowen said submission will really amp up closer to the deadline. Until then, seniors’ trepidation and excitement will continue to be palpable around campus. For more coverage of the process seniors are currently going through, please see the Voice’s I.S. Special Feature on page 5.